Does Green Tea Detox Your Body? Of all the detox products available, green tea may be one of the most beneficial, but that doesn't mean it literally detoxes your body. Instead, the active ingredients in green tea support your body's natural ability to detox. 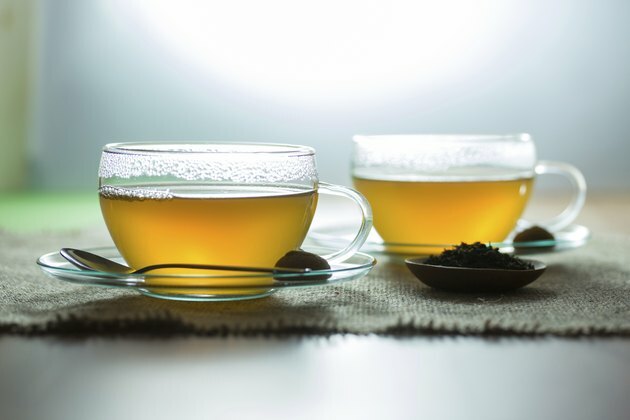 Before you try to detox using green tea, learn how the body detoxes itself, so you have a better idea about what to expect and how green tea contributes to the process. Green tea may help detox your body, but probably not in the way you might think. Your body detoxifies and eliminates harmful substances quite efficiently, which is a vital task considering the amount of toxins in the environment. Green tea doesn't actively detox toxins all on its own, but it's packed with natural polyphenols that support the body's normal detox system. Polyphenols work in two ways: they have a direct impact on your liver, the body's major detox organ, and they're antioxidants that fight free radicals. The molecules known as free radicals are so unstable they must be neutralized before they damage healthy cells. Detoxification means different things to different people. Some think of detoxing as purging stool from the colon using fiber and other supplements. Others interpret it to mean a type of diet -- usually a fast or some combination of juices and veggies -- that cleanses the colon while helping them lose weight. But in the medical world, detoxification refers to the body's built-in systems designed to eliminate toxic substances. The toxin may be an environmental chemical, excess medication that must be cleared out of the bloodstream, something produced in the body, or any other type of harmful substance. Your skin, respiratory system, immune system, intestines and kidneys all help the body detox, but a large part of the responsibility falls to the liver. When toxins reach the liver, they're chemically altered to reduce their toxicity, then they're sent to the kidneys for elimination in the urine. It sounds simple, but it's not. It's a complex process that consists of three different phases and depends on a bunch of enzymes. Your body needs sufficient protein and many vitamins and minerals to support each phase of detoxification. The primary polyphenols in green tea are flavonoids. Among the various flavonoids, some of the most potent antioxidants belong to a group called catechins. While green tea contains several different catechins, one of them -- epigallocatechin gallate, or EGCG -- is the most abundant and has the strongest antioxidant capacity, reported the World Journal of Gastrointestinal Pharmacology and Therapeutics in August 2015. Green tea also contains L-theanine, an amino acid that's used to produce another important antioxidant, glutathione. Green tea extract is a common ingredient in weight-loss supplements because it helps you burn fat and boosts metabolism, according to studies cited by Authority Nutrition. The antioxidants in green tea help lower blood pressure, and EGCG may reduce the risk of developing cancer by triggering the death of cancer cells, noted Biochemical Pharmacology in December 2011. In lab animals, EGCG protected nerves, suggesting a possible ability to prevent neurological diseases such as Alzheimer's, reported CNS Neuroscience and Therapeutics in 2008. Additionally, researchers have verified green tea's protective role in the liver. There's no way around it -- you need a healthy liver to properly detoxify your body. Green tea can help with that. For starters, the liver desperately needs antioxidants. The same chemical activity in the liver that neutralizes toxins also produces unavoidable byproducts -- free radicals. To stay in balance and keep doing its job properly, the liver must have enough antioxidants to counteract all of the free radicals. Green tea directly supports the liver by increasing enzyme activity that drives the first two phases of detoxification. Its impact on specific liver enzymes also explains other benefits beyond detoxification, such as protecting the liver from acetaminophen. Taking too much acetaminophen causes liver damage. Studies using lab rats demonstrated that EGCG reduced the action of liver enzymes involved in drug metabolism, which in turn limited acetaminophen's toxic impact on the liver, reported BioMedicine in September 2015. The bottom line -- that green tea seems to lower the risk of liver disease -- was the conclusion reported by researchers in the International Journal of Clinical and Experimental Medicine in June 2015. What Are the Benefits of Water on Liver Detoxification? Does Eating Oranges Help Detox the Liver?